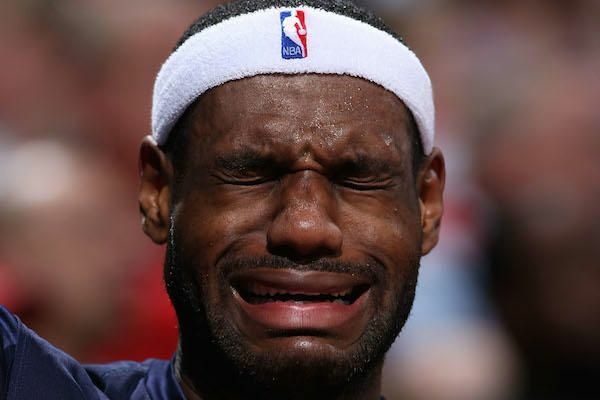 Poor, Poor Bron Bron. After laying an egg in Game 3 last night, you know he must have been feeling down. Emotions were running and this feelings were vulnerable. After walking off the court after taking the L from the Celtics while posting a 11 PTS, 4-13 FG, 6 TO stat line, things got even worst for King James. ESPN – LeBron got peeved at heckling fan after game. LeBron asked what fan had done. Dude replied: “I played at Hiram College.” Emotions were raw in the moment but the guy’s liquid courage was pretty hilarious. He was removed from arena shouting his college stats. Who does this fan think he is?! Some DIII basketball player has the audacity to confront Bron Bron for shitting his pants on the court against the Celtics?! Does he know who he is even talking to?? This is Lebron James, the guy who won 4 MVPs 5 years ago. The King of the NBA who won not one, not two, not thr… oh right, THREE championships!!! This fan is some punk who doesn’t understand the greatness of the King. And then, totally unfairly, the night for Bron Bron only got worst. During his press conference, some media reporter was rudely asking LeBron questions on why he was ineffective last night, which is completely out of line. And only to make matters worst, TNT and Twitter went after Bron Bron for playing like crap. It is unbelievable. Who would do something like this and kick someone while they are down? I just hope from the bottom of my heart that Bron can bounce back from this and recover from getting his feelings hurt. No one deserves to be bullied like that. And also, we know that Bron Bron has experience of this kind of rudeness before.